Books and Beans and Slime, Oh My! Christmas calls for festivity and has me feeling crafty and bake-y. I want to craft all the things! A few crafty things I’ve done lately……. I wanted to do an Advent calendar this year and decided to do one with books. Really outside the box for a librarian, I know. 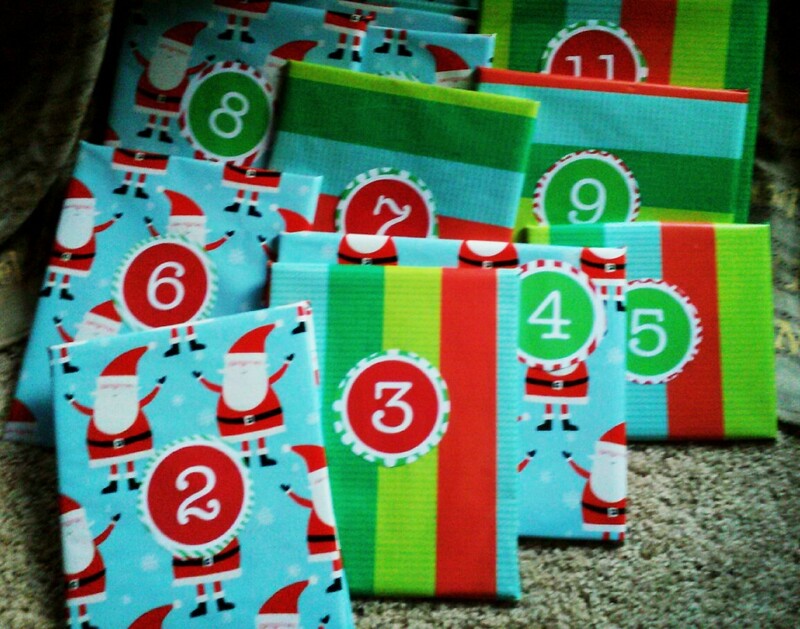 😉 I chose and wrapped 25 Christmas picture books that represent a diverse variety of stories. Printed some bright numbers and slapped them on. Done. Each day a new one gets opened and read. Yay Christmas! I made a new batch of beautiful, taste-safe, gluten-free play dough for the library using this recipe after my normal go-to gluten-free dough stopped working. This recipe calls for rice flour which isn’t cheap but dough lasts for awhile and you’re not going to make it all the time. No photo can accurately show what soft, pliable, white dough this turned out to be. Note: the recipe says to ‘cook’ it but I didn’t. Pouring hot water in the mix worked just fine. I love a sensory bin. Like, LOVE them. I’m a tactile person so that’s probably why I enjoy sensory bins almost as much as the kids do. This bin is sensory awesomeness in a box. I knew I wanted to create a festive red and green bin. TA DA! Here’s how I did it. I bought six bags of white navy beans. I left one of the bags white to break up the color just a little bit. Then I separated the rest of the beans into several gallon sized Ziploc bags. I used two little bottles of food coloring for the green beans. The beans took the green coloring really well. Making white beans red took a bit more work. Actually, it took two and a half 1oz. bottles of red food coloring for the beans to look red instead of pink. Let the beans sit in the bags for an hour (red beans sat for much longer) then dump the the bags on paper towels, cookie sheets or some such surface and spread them out to dry. Dump them in a bin. I added a pack of medium-sized jingle bells bought at the craft store. 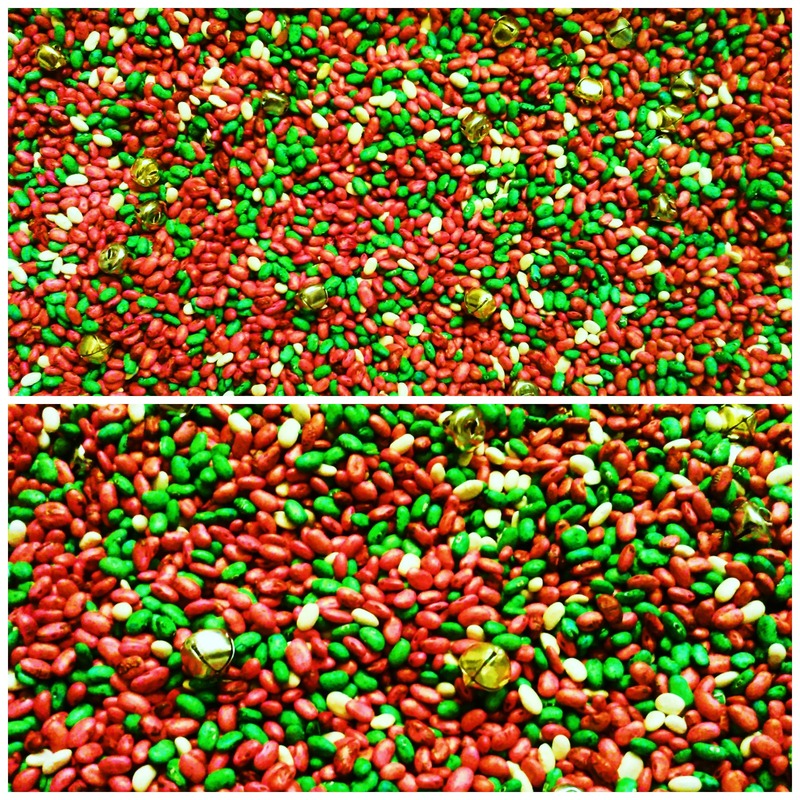 The red and the green and the little jingles, what kid wouldn’t want to dive right in? This, friends, is Holiday Slime! I’ve made so many batches of slime for the library but this might be my favorite batch of all. If you’ve never made slime, do it! Do it now! It’s simple: 1 part Elmer’s glue to one part water. Mix. If you’re going to color it (food coloring works best but you can also use liquid watercolors) add color while stirring until you get the shade what you want. Then in a separate container mix a teaspoon of borax with 1/4-1/2 cup of warm water. Stir until the borax is dissolved. Next, while stirring slowly pour the borax mixture into the glue mixture. It shouldn’t take long before you’ve a got a ball of slime in your bowl. Give a little kneading to help it come together and make it smooth. I added silver glitter to mine. If you want yours sparkly, it’s easiest to add the glitter to the colored glue mixture before you add the borax mixture. Otherwise, hand your kids some glitter and let them mix it in as they play. Beautiful, bright, sparkly slime never gets old. Now if you’ll excuse me I’ve got snowflakes to cut. Happy Friday!